Although dishwashers work hard to clean your dishes, the appliance itself needs a good scrubbing too. But why on earth does a dishwasher need to cleaned when it's running lots of scalding hot water during every cycle that would seemingly sanitize the unit? Well, we aren't talking about giving it a good scrubbing with a bristle brush and elbow grease (thank goodness). No, the type of cleaning we are referring to is deep down inside the drain hoses and pumps. Hoses carry the most residue and mineral buildup inside a dishwasher. This gunk can cause your dishwasher to have a musty odor while it's running. In order to clean the gunk that gets trapped in the hoses and pumps, you need a product that will dissolve it, which in turn will keep your dishwasher running smoothly and save you money on expensive repairs. What's the best dishwashing cleaning product? The solution is simple. 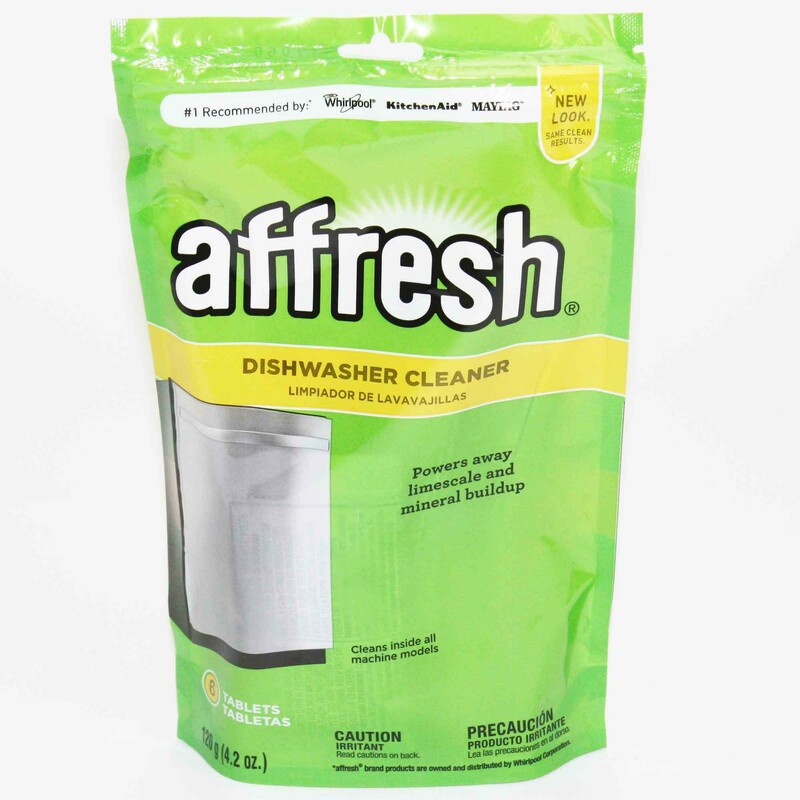 Affresh Dishwasher Cleaner will not only clean a smelly dishwasher, but more importantly , it breaks down the residue and buildup in your drain hoses and pumps. Household cleaners like bleach or vinegar, will NOT lift the residue from inside hoses. It will simply wash over the gunk, but can't break it down like an Affresh tablet. The citric acid in Affresh is what breaks down the buildup. Affresh cleaners come in tablets, and there is a great benefit to using a tablet over a liquid cleaner. Tablets dissolve more evenly throughout the wash as opposed to liquid cleaners which can drain out in the first cycle of the wash. Dishwashers have about 4 cycles in one wash, so you want a product to last throughout the entire cycle instead of only 25%! Affresh is also septic tank safe. When should I start using Affresh on my dishwasher? Honestly, from day one of purchasing your appliance. This will prevent mineral and limescale buildup, along with other residue that can do damage over time to your appliance. It will also prevent your dishwasher from getting a musty odor. What if my dishwasher already has an odor? If you have had your appliance for a while and a smell has developed, then it's most likely some buildup has occurred in the drain hoses and pumps. In order to break down the gunk it may take running a few cycles with an Affresh tablet spread out over the course of a few weeks. Many of the negative reviews online from customers that claimed it didn't remove the smell, is from people who have only run 1-3 cycles over a period of time, but still have substantial buildup to remove. The truth is, it may take 6-9 cycles over the course of 2-3 months to really clear out all of the residue, and thus get rid of the musty odor. The great news, even if there is still a slight odor, you are really cleaning deep down in your machine, which can save you hundreds of dollars down the road in future repairs. You can try using a tablet once a week for 3-6 weeks until the odor is gone, or spread it out and use it twice a month for a 2-3 months. One bag of Affresh Dishwasher Cleaner contains 6 tablets. Even if you can't see it, Affresh is still working! How often should I use Affresh maintence cleaning? Run one cycle in your dishwasher once a month with one tablet of Affresh. Can I use an Affresh in my dishwasher with dishes inside? This can be a tricky one. The only types of dishes we recommend having in the dishwasher while using Affresh are plain glass dishes with no design or paint on them. The nice thing about plain glass dishes, is that it may help remove spots on them if you use Affresh in that cycle. DO NOT use Affresh in a particular cycle if you have silver dishes in the unit at that time (not that you would want to put real silver in the dishwasher anyway). If you have dishes other than plain glass to clean, simply run a cycle with Affresh when the dishwasher is empty. 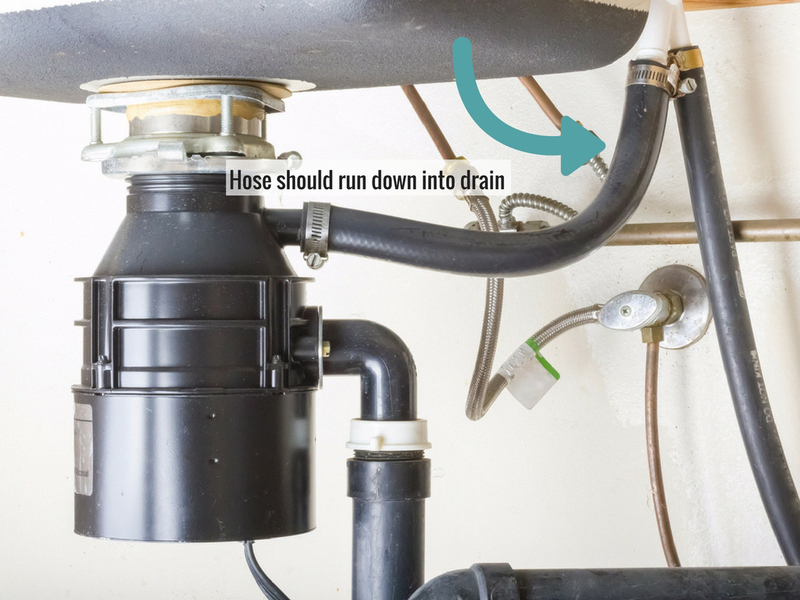 Make sure your hose is installed properly under the sink for proper drainage! This might sound like a no-brainer, but you would be surprised how common it is for hoses to be installed improperly. When you look under the sink, the hose from the dishwasher needs to be draining downhill into the drain. Sometimes hoses can be improperly installed below the drain, which causes the residue to back up because it can't drain uphill. Proper drainage is key to being able to clean residue from your drain hoses and pumps. Here is a photo to illustrate proper installation of a dishwasher hose. Read our blog on How to Extend the Life of your Washing Machine with Affresh Washer Cleaner. Hopefully we have inspired you to start using Affresh and keep your dishwasher runnning smoothly and saving you money on repairs! Previous article How to Fix a Samsung Ice Maker | ANYONE Can Do It!